SmarterMail is a fully enterprise-grade email server designed to compete directly with Microsoft Exchange and related products. 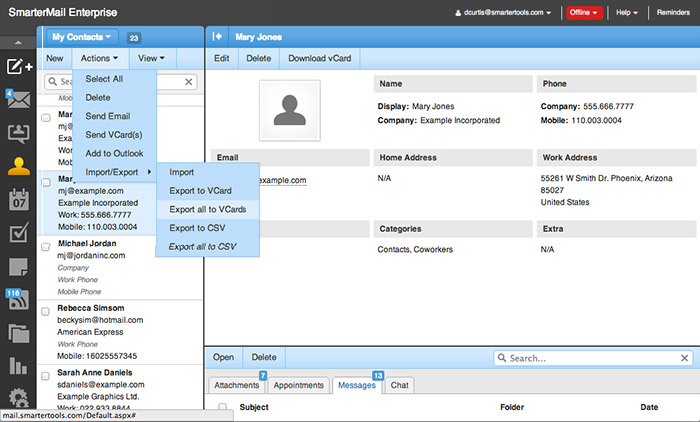 SmarterMail features industry standard Virus and SPAM protection, mobile support, support for instant messaging, support for email archiving for SOX & HIPPA compliance, support for file sharing and collaboration tools, and a host of additional features designed to make your work environment simpler and more productive. 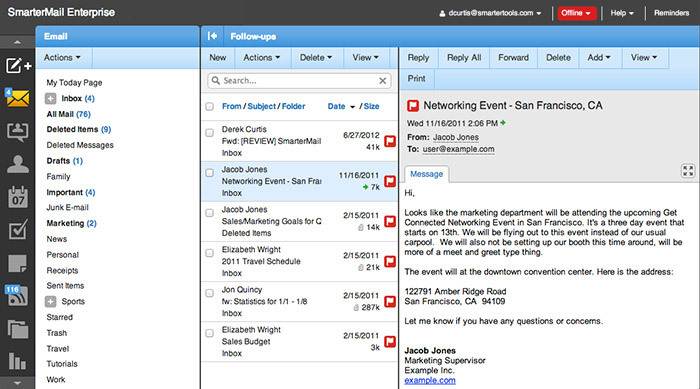 Want to take SmarterMail for a “test drive”? Talk to us! We’re happy to help and we’ll work with you every step of the way. Access your email, instant messages, calendars, contacts, notes, and tasks from any desktop, tablet or smartphone with an Internet connection. SmarterMail’s powerful graphic message editor gives you the ability to easily create any kind of message, from simple text messages to elaborate newsletters. 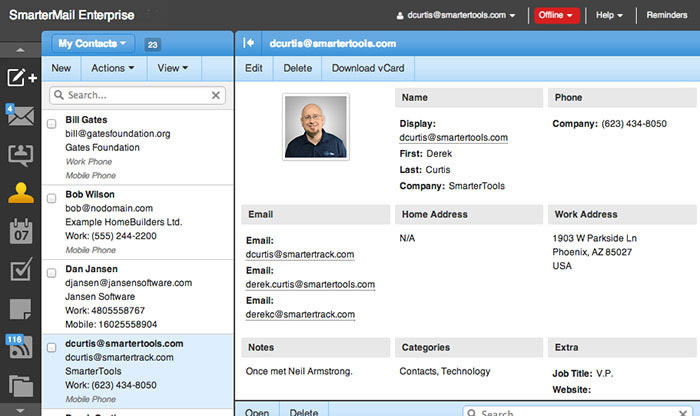 Use SmarterMail’s Robust search feature to find any message, appointment, attachment, contact, task, or note with just one simple click of a button. SmarterMail’s intuitive Spell Checker includes support for multiple languages, including RTL languages. Users can add their own words to their dictionaries and it even includes grammar support. Completely customize your calendar views as either daily, weekly, monthly, or all appointments; add recurring events, and easily show free-busy dates. Your calendar can also be easily shared with others. 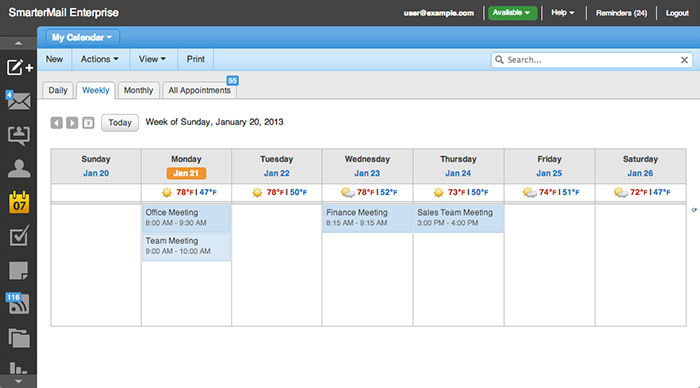 SmarterMail’s built-in room scheduling support makes it easy to find a time and a place to meet. If there’s a conflict, a message is prominently displayed to avoid mix-ups. SmarterMail allows you to add pictures to your contacts, so you can easily recognize the person you’re emailing or scheduling an appointment with. 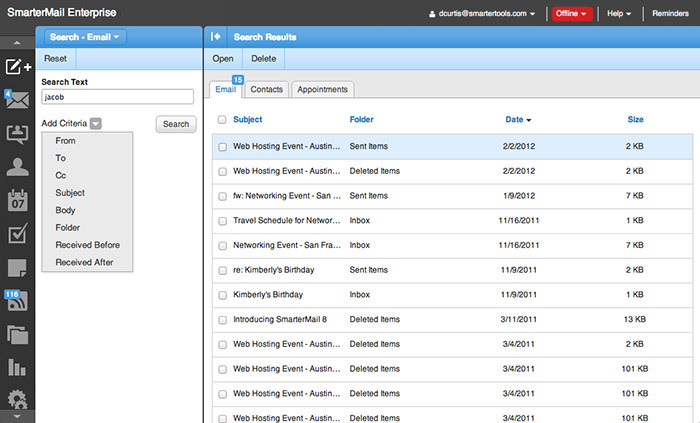 Businesses can take advantage of SmarterMail’s mailing list support to send mass emails to customers or employees. 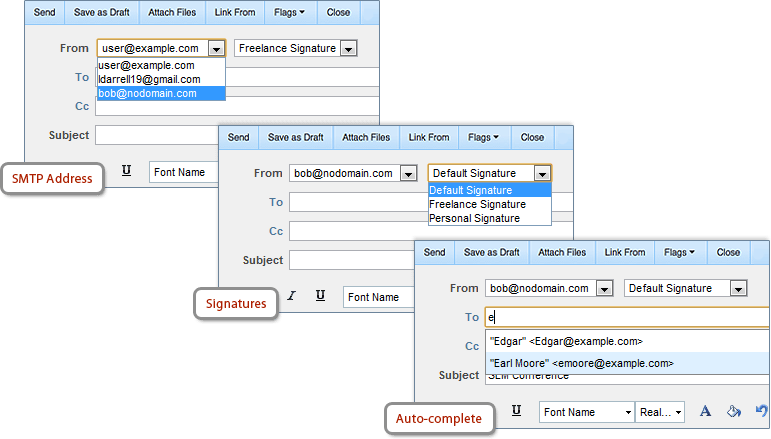 Manage opt-in lists and distribute email to large groups quickly and easily. Sign up today and receive a complimentary (no charge) SmarterTools Professional Bundle with any Windows VPS or Dedicated Server. SmarterMail – Pro 250 Mailboxes, a $299 Value – SmarterMail delivers Microsoft Exchange-level features for a fraction of the price. SmarterMail includes 97% spam protection out-of-the-box, superior stability, advanced synchronization with Microsoft Outlook and hundreds of mobile devices, detailed reports, events and notifications, and an industry leading Webmail interface. The Enterprise edition adds optional Exchange ActiveSync, enhanced collaboration, message archiving, and robust mailing lists. SmarterStats – Pro 50-Sites, a $299 Value – This Web log analytics and SEO software application provides businesses with an in-depth analysis of their website traffic, visitor behavior, and SEO marketing efforts. SmarterStats features the ability to contrast real data against spider/bot traffic plus mobile phone reports, search engine ranking reports, data mining, and additional keyword and competitor analysis. The Enterprise edition adds scheduled and on-demand email reports, custom reports, and distributed log analysis. SmarterTrack – Pro 2-Agents, a $199 Value – This powerful customer service software transforms customer service efforts into a comprehensive, multi-channel communications portal with features like a Ticket system, Live Chat, WhosOn, language support, data mining, reporting, and a Knowledge Base. The Enterprise edition includes custom reports, scheduled and on-demand email reports, cost analysis, custom field reports, surveys, branding support, agent chat rooms, agent roles, and the ability to link to third-party databases via external providers.